A paradox of life is that as a child you dream of being an adult and can’t wait to grow up, and as an adult you end up fondly reminiscing those carefree, fun days of your childhood. I suppose the big thing about adulthood for kids is the liberty to do whatever you want. No bed times, no dietary restictions, no compulsory hats and scarves when going out. Then as an adult, you realize that you actually want to go to bed early enough, your teeth get rotten and your tummy will ache with a diet of candies and chocolate, and – at least in a climate like Finland’s – you are willing to do everything in your power to insulate yourself from the terrible cold winter. But every now and then it is good to forget about your pragmatic middle-aged self and channel your inner Pippi Longstocking and do something less sensible to fully enjoy the benefits of your liberty. You owe it to your dreaming 10-year-old self. One of my (and my spouse’s) ways to enjoy this freedom is to start too ambitious cooking projects at very insensible times – e.g. starting to make fresh stuffed pasta at 9 o’clock in the evening on a week night. (Well ok, my 10-year-old self might not have been very impressed with this kind of “rebellism” but I am middle-aged after all.) Making fresh stuff pasta is always an impossibly long project so you will then end up eating totally exhausted at a time that most adults consider to be closer to a proper breakfast hour than dinner time. But it is still a very enjoyable meal! However, in case you are feeling less daring about your evening schedules, you can also split the workload into two evenings as I did with this recipe. I prepared the dough and the filling in one evening and then turned them into ravioli the next. Cook the spinach in boiling water (for some minutes) and after that, drain and squeeze the water out of them as much as possible. Chop the spinach. Make the pasta dough by combining the two types of flour with the eggs, spinach and a pinch of salt. Knead until you have obtained a homogeneous dough. Wrap the dough in a foil and leave it to rest in a cool place (e.g. fridge) for at least 30 minutes. Cut the shallots into small pieces. Chop the parsley. Cut the salmon into small(ish) slices. In a pan, heat some olive oil and cook the shallot on a low(ish) heat for 3 minutes. Add the salmon and continue cooking for another 5 minutes. Season with salt, pepper and a dash/ splash of white wine. Continue cooking for 3 more minutes. (Tip: In case you prefer your salmon not overly cooked, you can prepare the salmon in two batches. The first 250 g should be more well-done as it is used for the filling and it is then easier to mix. The second 150 g you can cook in a shorter time frame as it is used in the sauce). Let the salmon cool down. Take 250 g of the salmon and mix it together with the ricotta and parsley to prepare the filling. Season it with salt and pepper. Roll out the dough into a sheet that is 1 mm thick. Take one half of the sheet and add small (walnut size) portions of the filling at equal distances (at least several centimeters apart). Place the other half of the sheet on top and gently press it around the edges of the filling. Using a ravioli cutter or a pastry wheel, cut squares around each filling to make the ravioli. Finally press the sides of each ravioli tight with a fork to ensure the filling will not leak out of it during cooking. You can find a good example of how to do this process exactly for example here. In a pan, melt 60-70 g butter on a low heat with some leaves of sage. Cook the ravioli in salted, boiling for a 2-3 minutes (they float when they are ready but you can always also check the right time by cooking one piece before the others). Serve the ravioli with the sage butter and the remaining pieces of salmon. I have admitted earlier that I am not a winter person. At all. What I am even less, is a January person. I think January is the Monday of months. In this part of the world, it is criminally cold and terribly dark. There is nothing exciting happening as everyone is on a diet and just moping at home wearing wooly socks (apart from that sensible bunch who can elope Finland and head to a tropical country for a week or longer). Well, ok. Views may be somewhat decent(ish) in January too. Anyway – decent or not – on a more positive note, when the end of the month finally approaches, an anti-January person feels quite rejoiceful and festive. And obviously a celebration to welcome February should be accompanied by some fab Italian food. My adventures in the Italian kitchen have already earlier made me renew my appreciation for chicken legs. This dish is another recipe to maintain that appreciation. It is also a brilliant all-rounder. It is flavoursome and fantastic for those February feasts but yet simple enough to also brighten the bluest of Mondays anytime of the year! Clean the chicken legs (if needed – in Helsinki they are usually quite clean without any leftover feathers). You can also remove the skin of the legs if you prefer a slightly lighter dish. Peel and chop the onion. Wash the lemons and grate their zest. Squeeze the juice of the lemons into a cup. In a pan, heat the olive oil with the rosemary, sage, chopped onion and (entire) garlic clove. Add the chicken legs and season with salt and pepper. Fry the legs for a few minutes to get some colour on them. Pour in the white wine and let it evaporate. Add the lemon juice. Cover the pan with a lid. Let the chicken legs cook on a low heat for approximately 45 minutes (until cooked). During the final minutes of cooking, add the lemon zest. Serve immediately. Some things in this world – such as 80s shoulder pads, most of the Finnish Eurovision Song contestants, the English weather and my baking skills – are left without much recognition for understandable reasons. Yet there are also some things whose lack of appreciation is more unfortunate. Take chicken legs for example. For years, I have seen everyone praise the qualities of chicken breasts and they are a part of every street-credible athlete’s and nutritionist’s diet. However, Italian recipes have now taught me that by eliminating the fat and bones of your chicken, you also eliminate the possibility to add more flavour to your dish. Chicken legs are also relatively inexpensive. Thus, I would dare to suggest that they are the underrated (but hopefully rising) stars of today’s kitchens! This chicken leg recipe originates from Giogione’s book (Giorgione – Orto e Cucina). Giorgione hasn’t defined the exact quantities for some ingredients of this dish. Fortunately I was not as unlucky as the last time when experimenting with a bit vague recipe, and this secondo turned out great and tasty. However, I think the next time I will consider adding a bit less olive oil and more wine and herbs to increase the flavour even more. Mix together some salt, pepper, white wine, olive oil, the rosemary and sage and pour the marinade onto the chicken legs. Leave to rest for some time. Oil an oven tin. Take one chicken leg at a time, roll it once more well in the marinade, wrap one slice of bacon around the leg and place it in the oven tin. Keep the leftover marinade for later use. Bake the bacon-wrapped (or without bacon as I did) chicken legs in the oven at 180C for 30 minutes. Add the mulberries, some more white wine and a little bit of additional olive oil and salt to the leftover marinade, and mix gently. Leave to rest while the chicken legs are in the oven. After the first 30 minutes of baking the chicken legs, take them out, and pour the mulberry sauce onto them. Cover the oven tin with aluminium foil and return the chicken legs to the oven for another 30 minutes. There was a bit of a milestone in my path of food-blogging some weeks ago: I got a recommendation for a recipe for my blog! Coming from a reliable source of a fellow foodie, I was eager to give it a try. My friend also helped me prepare the dish which was certainly a bonus – especially considering that making fresh ravioli does have quite a few similarities with baking. And yes, all the ravioli in the picture were made by her. The ones I put together were of a shape that could be politely described as “creative” or “interesting” (along with “unphotogenic”). 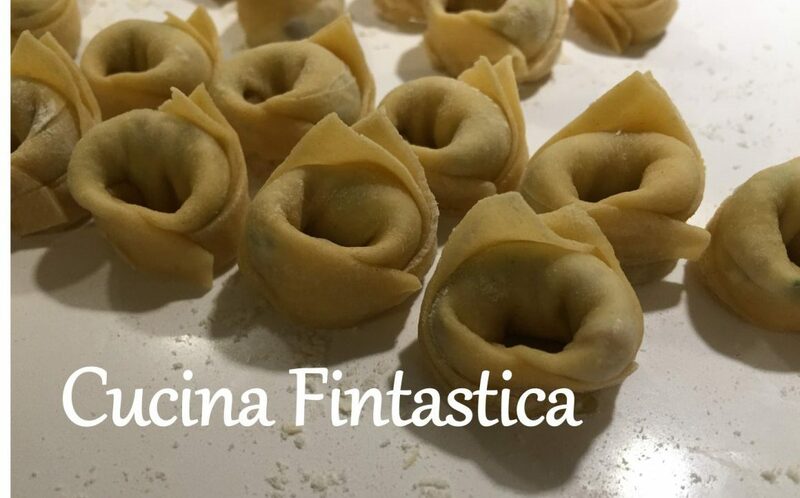 Despite being previously unknown to us, ravioli (or tortelli) di zucca is apparently again one of those very traditional and famous recipes in Italy. We weren’t exactly right in season with our timing of cooking it since it is in fact also a typical dish to be made on Christmas Eve… However, since we aren’t Italians, we just simply enjoyed a lovely dinner without feeling any urge to belt out a couple of verses of Rudolph the Red-Nosed Reindeer! There is one nice twist about this recipe: it includes biscuits! The recipe I found recommended that you use amaretti biscuits which I managed to also find in Helsinki. They had quite a distinct almondy flavour although they do not necessarily include any almonds but only apricot kernels. My friend’s recipe on the other hand utilized the cantuccini biscuits. Apparently both work really well with the pumpkin. In addition, the union of sage, butter and parmesan to top the ravioli is just superb! Clean the pumpkin and cut it into slices. Remove the seeds. Place them on a parchment paper on an oven tray and cover with some tinfoil. Cook the pumpkin slices in the oven at 200C for 25-30 minutes until soft. Let them cool down. In the mean time, prepare the pasta dough. Place the flour on a board or in a bowl. Crack the eggs into the centre of your flour. Add a pinch of salt and start kneading the dough. Add a little bit of water if needed. Continue until you have obtained a smooth and homogenous dough. Roll the dough out with a pasta machine or a rolling pin. The dough should be fairly thin to be ready for the ravioli (you can check out e.g. Jamie’s tips on how to roll the dough well if you are unsure what to do!). To make the stuffing, mix the amaretti biscuits, parmesan, salt, pepper and nutmeg in a blend. Peel the pumpkin slices, add to the mixture and blend well. If the stuffing seems too moist, you can add some bread crumbs to it. Cut rectangle or round shapes of your pasta dough with a glass or some type of a rolling cutter (mine was a pizza cutter!). Add a little bit of the stuffing in the middle (do not exaggerate to be able to close the ravioli properly) of a dough slice. You can brush the edges of the pasta lightly with water. Place another dough slice on top and carefully seal the edges (my friend used a fork quite successfully for this purpose). Alternatively, you can roll out two big sheets of the pasta dough, add bits of stuffing within equal distances of each other on one sheet and then place the other sheet on top, and only after that cut the ravioli into shapes and seal their edges. Cook the ravioli in salted boiling water for 3-5 minutes (usually they are ready when they start floating on the water). Make the butter sauce by melting the butter and adding the sage. Serve the ravioli with the sauce and freshly grated parmesan.